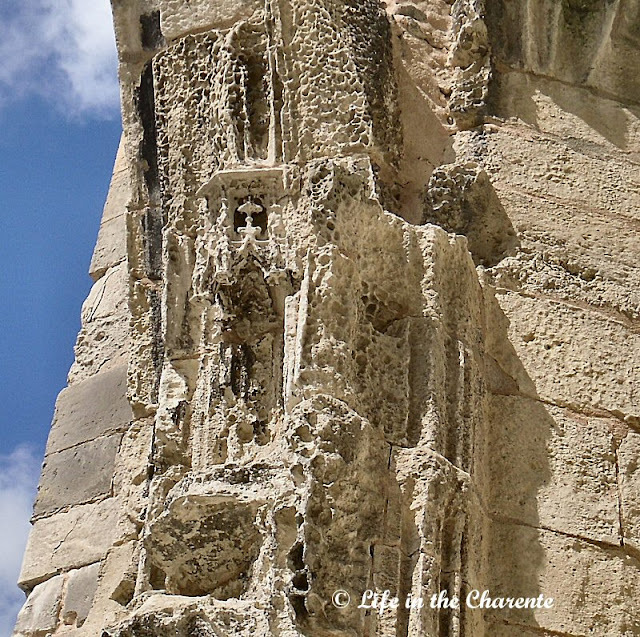 After our short stay in Barcelona, we went on a 7-day cruise around the western Mediterranean, at the invitation of a very dear friend of ours. 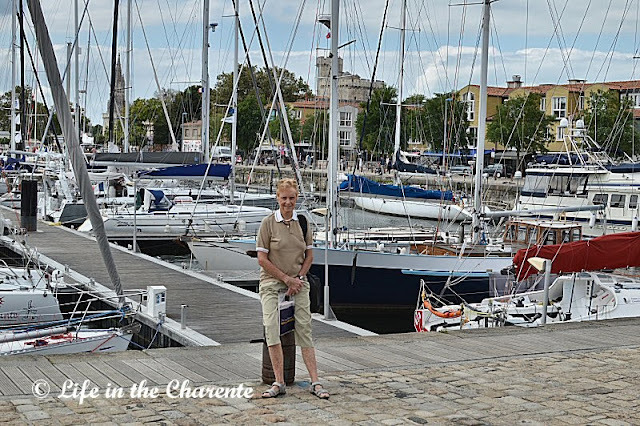 I will come back to the cruise at a later date, as a blog about the Charente is somewhat overdue! 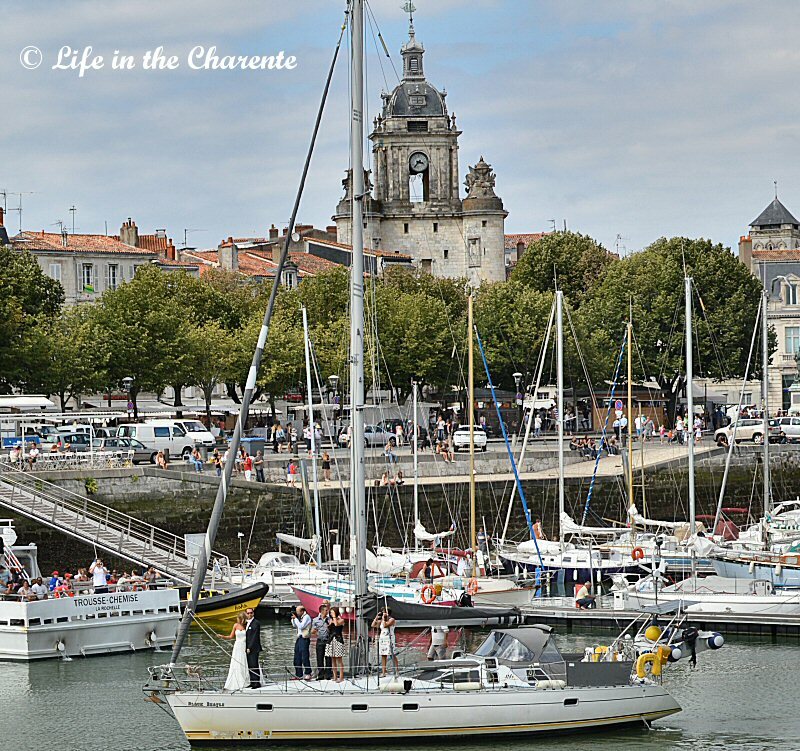 This account is actually related to Charente-Maritime, the French department sandwiched between Charente and the sea. We spent 3 days in La Rochelle, its capital city, and the surrounding areas just recently; this was part of my birthday present from Nigel. 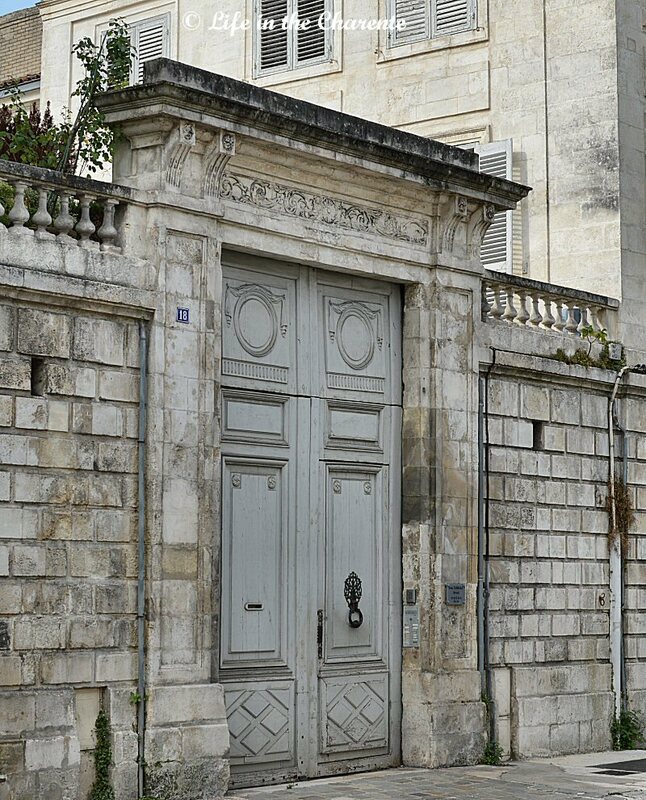 I have, for some time now, wanted to see La Rochelle and he booked this as a surprise! I had no idea where we were going, and as he took a winding back-road route, it was only when we were quite close that I realised what our destination was! The area enjoys up to 3000 hours of sunshine every year, on a par with the climate in the south of France! 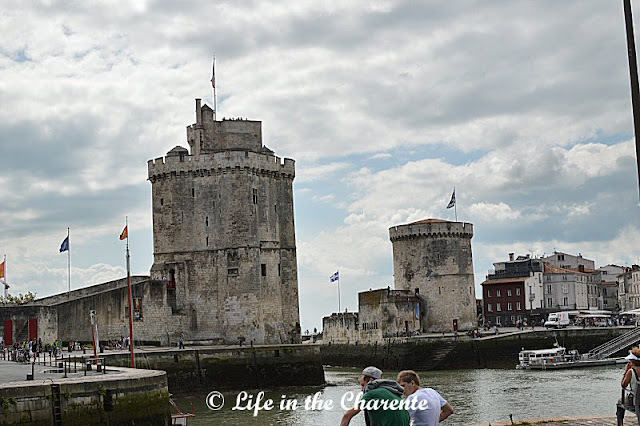 La Rochelle is a seaport on the Bay of Biscay, part of the Atlantic Ocean. The city is connected to the Île de Ré, a large offshore island, by a 2.9 km bridge completed on 19 May 1988. This port city has a long, interesting and complex history and for those who may like to read more about it, I suggest that you take a look HERE. I apologise for a longer post than usual, but there was so much to see and there will still be a part 2! 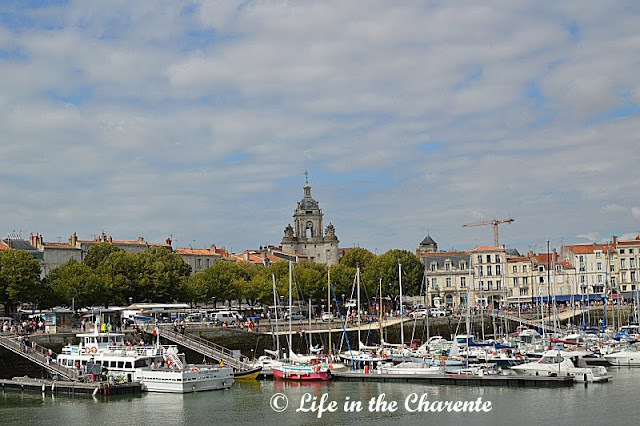 The "Vieux Port" ("Old Harbour") is at the heart of the city; the area is very picturesque, the quays and adjacent streets lined with seafood restaurants and stalls selling all kinds of things! Here are two of the three world famous towers of the Old Port, guarding the entrance to the harbour. The Tour Saint-Nicolas is the tower on the left and the other is the Tour de la Chaîne, the central tower. These two, and the third tower, the Tour de la Lanterne, on the far right of the photo below, are all that remain of the 14th century medieval walled city defence system destroyed by Cardinal Richelieu, during his siege of the city in 1628, where Huguenots were holding out against the Catholic forces of King Louis XIII. 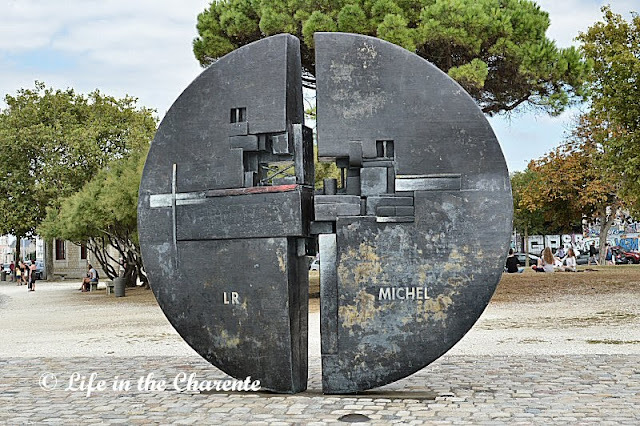 A more recent and striking monument, erected in 2009 in front of the ancient towers, is in honour of Michel Crépeau, a minister, deputy and mayor of La Rochelle between 1971 and 1999. 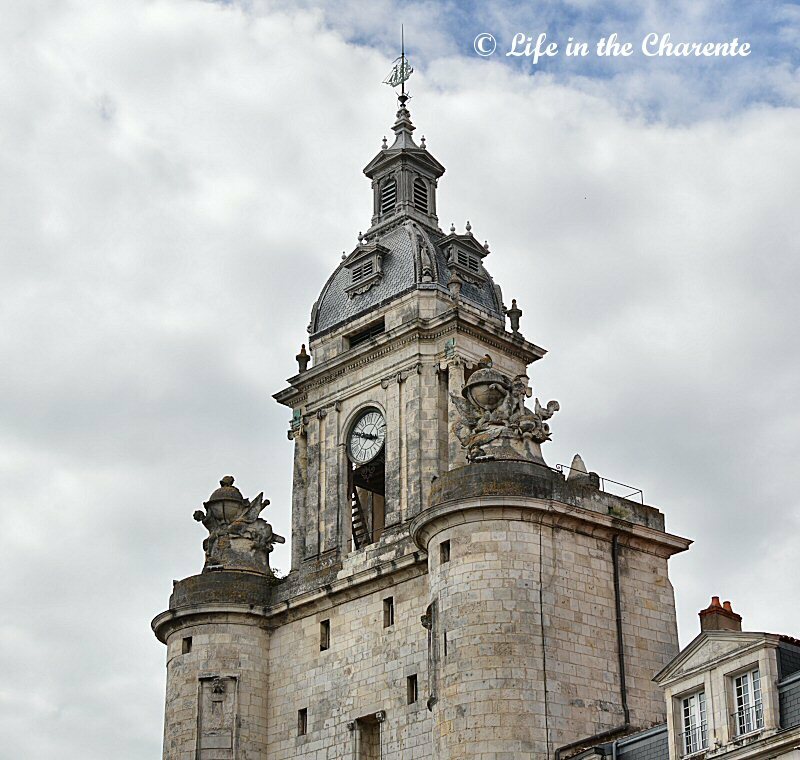 "Replacing a 12th century Romanesque church, a Gothic version was pulled down in 1568 during the religious wars; all that remains is its bell tower. 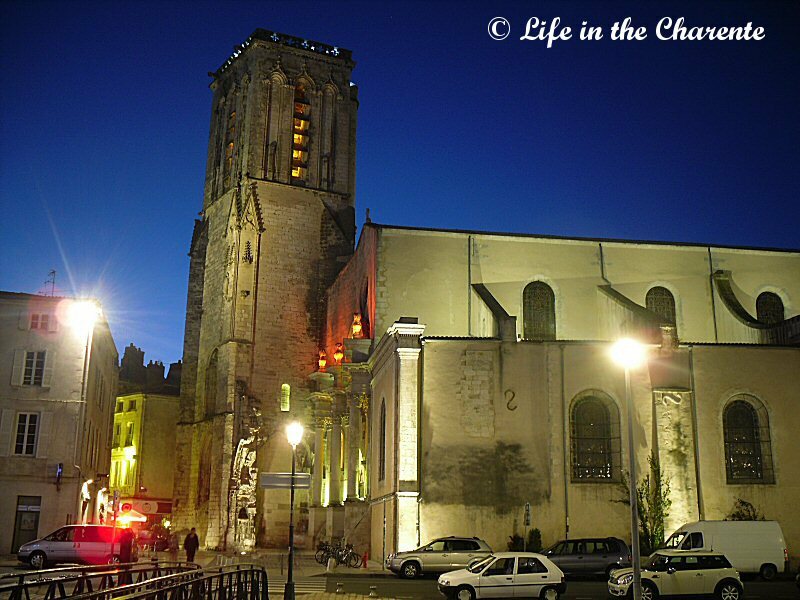 Rebuilt for the third time in the 17th century, the church was burnt down in 1705, only the façade surviving. The present church consecrated in 1718 has long been the sailors' parish church. Some of the eroded and crumbling stonework of the bell tower. and the church beautifully illuminated by night. Just behind the docks is the Grosse Horloge (Big Clock Tower). I can't fault the description! We had a thoroughly enjoyable visit to the Aquarium, but I would suggest if you want to visit here, it would be best on a week-day and NOT during the school holidays. We were there one day before the children went back to school and it was packed with children and parents with push-chairs!! The odd looking Flying gurnard. It does not actually fly, but appears to, when swimming under water! Pterois, commonly known as lionfish, is a genus of venomous marine fish found mostly in the Indo-Pacific. 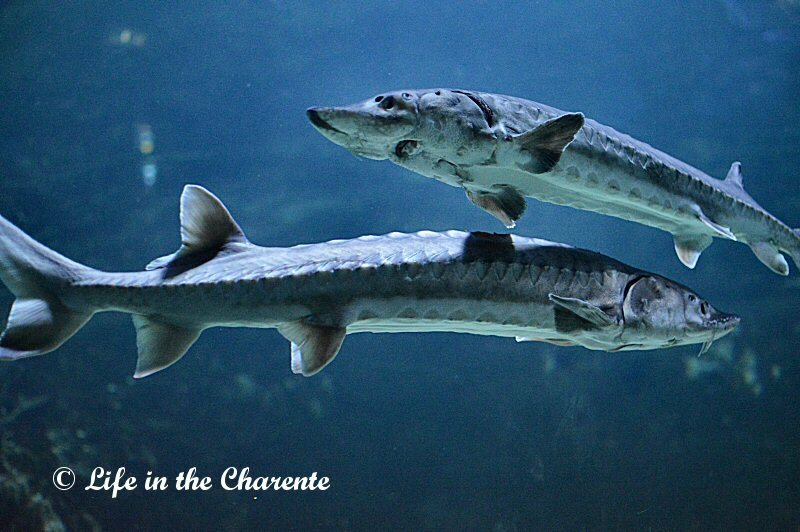 Argyrosomus regius (also known as meagre, shade-fish, salmon-basse or stone basse). Apparently very tasty with great nutritional value! We've seen some on a restaurant menu since! 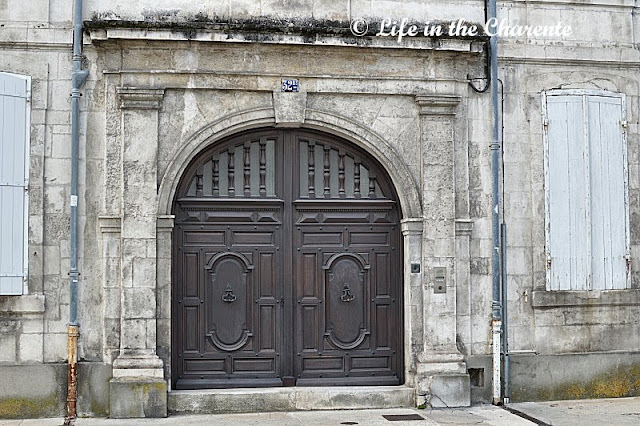 I just liked these two stylish and obviously expensive gateways, above and below. There are still some half-timbered houses in the city, which date back as far as the 15th century. The arcades themselves were once used by merchants to display their goods. Finally, just to prove we really were there (! ), myself and Nigel at the Old Harbour. Sorry the latter has taken so long to update!! Spectacular pictures! It must have been wonderful to take a cruise in the Mediterranean! I only went to the Island of Elba, which is about a one hour "cruise" from Italy but thinking of the Titanic, I didn't really feel very comfortable. We're in Paris right now...for a few more days. Beautiful place and great photos, thank you so much for having us come along in your travels. So much history in this place. You have yourself a wonderful week. How fun to take a cruise on the Mediterranean. You guys go to the best places. Your fish photos at the aquarium are amazing Diane. What a lovely birthday surprise destination and such great photos. What a kind and thoughtful chap you have there! 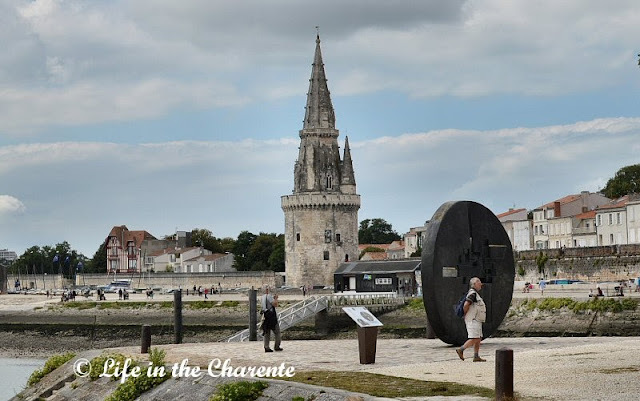 I loved La Rochelle and always wanted more time to walk around when we went with friends to the Ile de Re...so your super photographs brought it all back. Thank you. And thank you too for your kind wishes on mine. Wow, such an amazing place. And what a sweetheart that Nigel is to take you here for your birthday. You are so blessed to be able to travel a lot in these beautiful places. MI dear Diane: What a wonderful birthday present, love to see you and Nigel on the pictures, you both look great. A lovely place, I enjoyed the pictures as always! And, may I say HAPPY BIRTHDAY to you!! What a lovely surprise for you Diane. I am so pleased you enjoyed it. You must spend hours on these blogs of yours as they are packed with such interesting information about the places you visit. As always, this was another fascinating post with great pictures. Diane, what lovely and beautiful travel, I m sure you and hubby had a lovely and fun time Diane, the pictures always are amazing I love them!! What a wonderful surprise Nigel had... up his sleeve for you! A trip I wouldn't mind to do since I don't know La Rochelle. You have taken great and interesting shots! I always learn so much about your area through your posts. 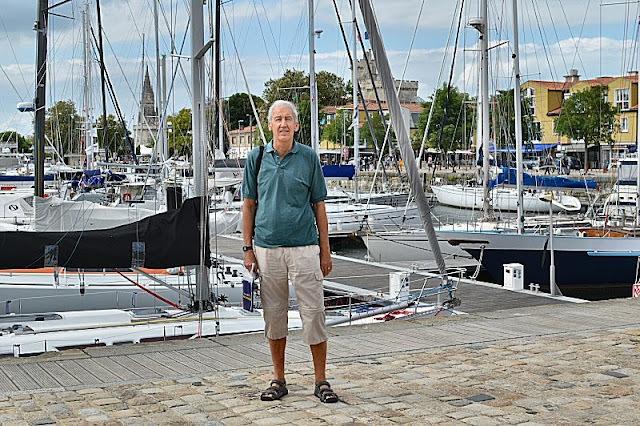 That was very sweet of Nigel to surprise you with a trip to La Rochelle! Amazing photos. What a great birthday present! I've not yet been to La Rochelle, but hope to get there one of these days -- in fact I'd love to explore much much more of the Atlantic coast of France. 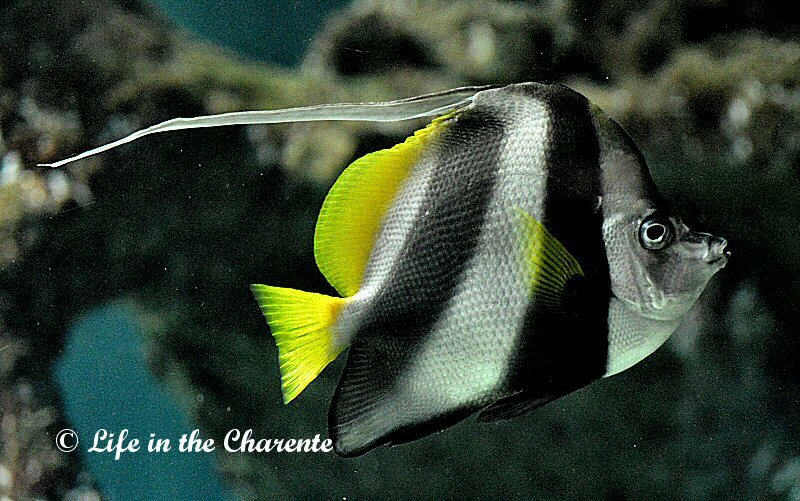 Our son worked in the Vendee for a couple of summers and we enjoyed our visits there very much. Your pictures are wonderful and you and Nigel look absolutely fab! Well, I'm very late wishing you a Happy Birthday, but Happy Birthday anyhow. This was a wonderful gift. 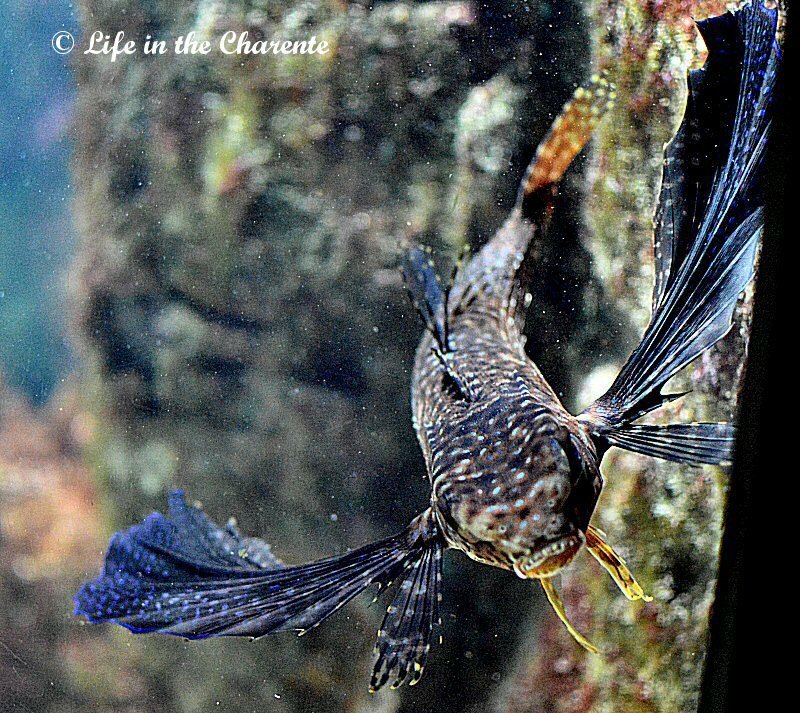 I enjoyed all your photos, amazing place, and the fish photos were great too. And of course it's always lovely to see the person who put together such a lovely post, along with your hubby. Thank you, and wishing you a great week. Your pictures are just wonderful..thanks for sharing all your trips..I always feel like I have been with you..
What I lke about your blog is that I get to see the places which are on my travel wish list since forever ! I really like travelling "with you" through your posts Diane. 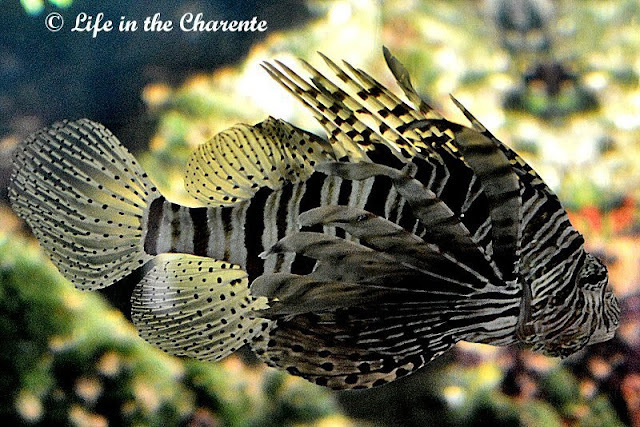 I particularily love the pictures of the fish. Merci pour cette ballade. 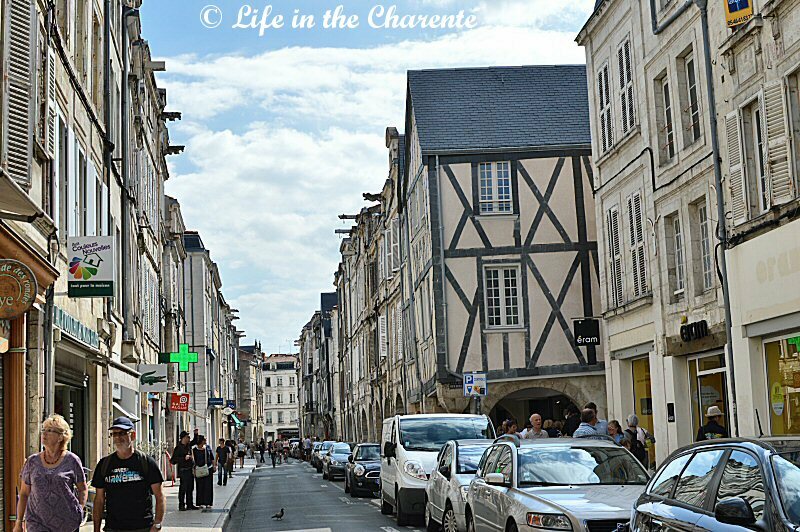 La Rochelle est une ville que j'ai beaucoup aimée visiter. Another one of your great tours, Diane. I love that you took the picture to show you were there!!! Those buildings are marvelous, aren't they? When I look at the old churches, I just drool... well, that and the old, half-timbered streets. Looks like you had a grand time. I really enjoyed this post. My ancestors were Huguenot refugees who came to Virginia (via Holland then England) from a place near La Rochelle--a little village now called St. Nazaire-sur-Charente. I'd love to visit someday. Thanks for the peek. Harbor towns always have their own unique personalities, despite the commonalities. Lovely stonework throughout this one. I especially loved the two gates you featured. And it was nice to see pictures of you and Nigel! Thanks for sharing beautiful images. The newly wed on the yacht made me look again and again. That must have been fantastic! 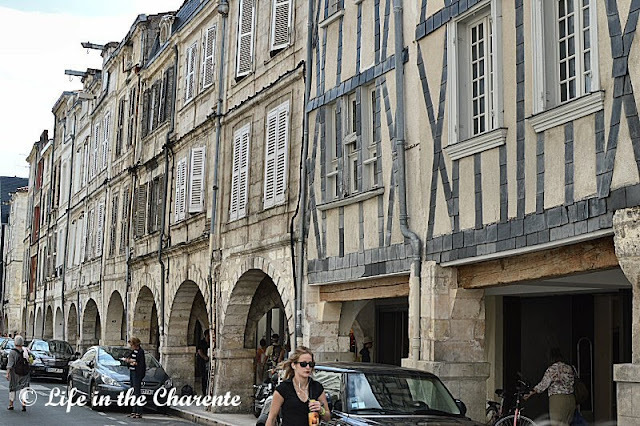 La Rochelle looks so very familiar; a French seaport and old town like so many. The grey stone is attractive. I wish we could still travel about as we used to do, but husband’s eyes and legs complain when they are overtaxed. France is a great love of ours and we have done quite a bit of ‘sightseeing’ there in the past. Your photos and articles will have to remind us of the glories we now miss. Woo hoo! What a great surprise---how nice of Nigel! Great pics of the both of you and the rest are pretty great also. Love the doors as usual. Not sure why they are so fascinating, I always wonder what is going on behind them... And the more sunlight, the better! I love your travelogues, and you should be in the business, Diane! Pam it was a lovely surprise and a great present. I would be hopeless in the business Pam, I get very impatient when working with people, now if I could travel with animals ....... ;-) Have a good week. Hi Diane .. 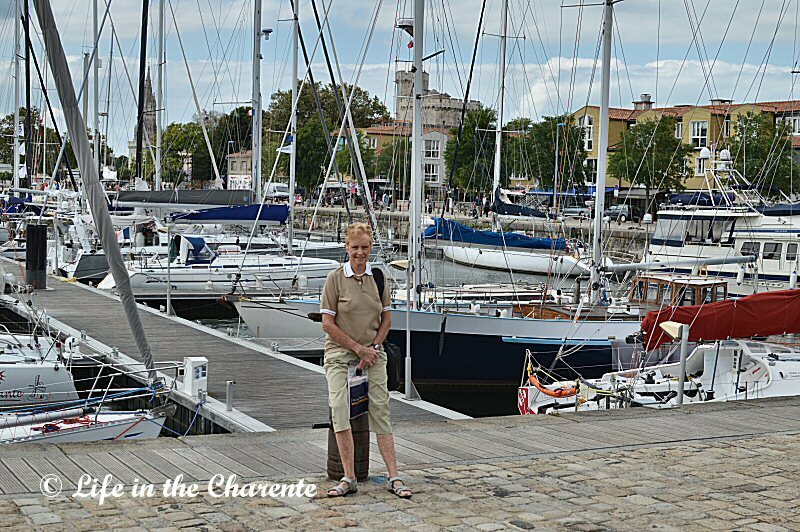 I've always wanted to visit La Rochelle .. what a brilliant birthday present and such fun finding it as a surprise ... gorgeous photos ..
Hilary it was a fantastic idea and present, I was very impressed. Will do part 2 as soon as I have time. So much on and so much from the garden to bottle etc, not much time to myself as such. Keep well Diane. The age of these old towns just blows my mind. A fascinating place the buildings are so so so old. Lovely shots too. You both are looking fit and relaxed. Funny, within the 16 years I've spent in SA, I never saw a phasmid!! No need to be scared, they wont eat you... they prefer brumbles! LOL!! 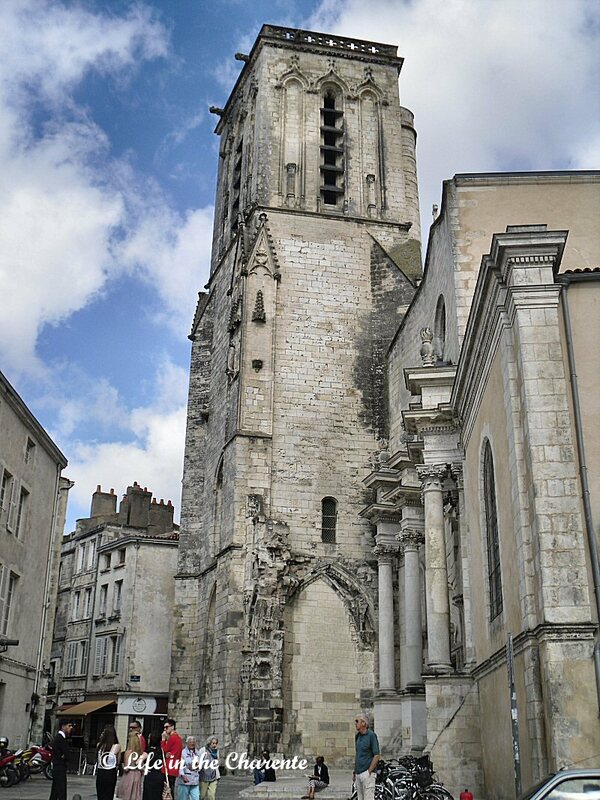 I've always intended to visit La Rochelle but for some reason I've never managed it. Maybe one day. I'll save my pennies before visiting the Ile de Ré, though. Such beautiful photos! I think you have become an expert at it!